You’ve probably never have thought of traveling in Azerbaijan. Admittedly, I hadn’t. Many people haven’t even heard of Azerbaijan before. I’ll admit it’s a fairly obscure tourist destination, especially for North American travelers. However, I’m in the business of exposing my fellow Jetfarers to new, fascinating, and sometimes strange places. Azerbaijan is one of them. There are few countries in the world where you can dip your toes in the cool waters of the Caspian Sea, watch natural, unprovoked fires burn from the earth, and take a relaxing bath (Or highly stressful? You decide…) in pure crude oil. Yep, all of these are things you can do while traveling in Azerbaijan. An oil-rich country located off the ancient Silk Road, Azerbaijan has a history and culture that spans many centuries. However, it was occupied for several years (and many of its historic buildings destroyed) by the Soviet Union until its downfall in 1991. Since then, Azerbaijan and its people have been on a quest to restore their independent identity, and attract visitors to come learn about it in the process. Today, Azerbaijan is most famous for being rich in energy resources such as natural gas and crude oil. If you do find yourself in the Caucasus region and want a taste of what Azerbaijan has to offer, read on! In this post, I’ve detailed 17 of the most exciting and unique places to visit in Azerbaijan. No list of places to visit in Azerbaijan would be complete without the metropolis of Baku. Azerbaijan’s capital city is known for being the headquarters of the country’s oil and gas operations. Energy executives and rig workers come here to extract these precious resources from the ground near the Caspian Sea. 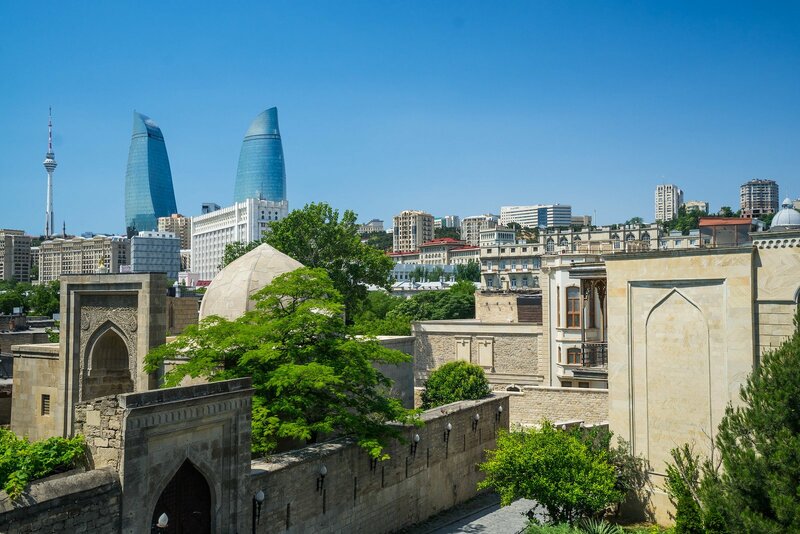 As a result of the rampant oil production in the area, Baku is, in one word, flourishing. From a distance, the city feels shiny, cosmopolitan, and buttoned-up. The flame towers peek over the skyline and dazzle through the night with a spectacular light show. Seaside boardwalks meet busy streets lined with the world’s most coveted brand-name stores. Men and women dressed in the most stylish clothing and designer sunglasses walk hurriedly down the street. It’s basically the New York City of Azerbaijan (minus the pizza). Upon a closer look, you can still find small pieces of Baku’s history that give it character. Tandir bakeries with the smell of warm bread wafting through the window. A refurbished old city with a few too many souvenir shops. Fruit stands set up on the sidewalk and underground traditional restaurants. The zenith of city attractions in Baku is the strange, spaceship-looking Heydar Aliyev Cultural Center. It’s the weirdest building I’ve ever seen in my life, taking the shape of something between a melted marshmallow, a cloud, and a mushroom. Yeah, try and picture that. Inside, there’s a museum boasting local contemporary art and other rotating exhibits. While exploring, you can see some of the city’s museums, like the Carpet Museum. I also recommend taking a free walking tour to orient yourself to some of the legends and history of the city. At night, you can head to the Upland Park viewpoint (you can go via the Funicular car if you so choose) to watch the 8:30 PM light show on the Flame Towers and treat yourself to a stunning sunset view of the city and the Caspian Sea below. Budget: For backpackers and budget travelers visiting Baku, there’s no place more cozy, clean, or comfortable than Sahil Hostel & Hotel. Complete with a full kitchen, a chill lounge area, and a terrace, it’s the perfect place to settle in for a few days without breaking the bank. Mid-Range: If you’re looking for a great value in a central location, Viva Boutique Hotel is a fantastic hotel option. Located in the heart of Baku and just a short walk from main attractions like the Boardwalk and the Old City, Viva is an affordable option for budget-conscious travelers. Splurge: Inside the iconic fire-like buildings of Baku is one of the premier hotels in Baku, the Fairmont Baku Flame Towers. Complete with spacious rooms, a rooftop pool and bar, a spa, and other amazing amenities, the Fairmont offers a luxurious respite from the chaos of the city. Towards the west of Azerbaijan lies Ganja, one of the country’s largest cities after Baku. It is a very historic city, having changed hands throughout the centuries of its existence. And thus, it boasts several interesting and ancient attractions that visitors can explore. While in Ganja, you can start off your days strolling around the Heydar Aliyev Park, which is one of the largest in the Caucasus region. There’s an iconic archway near the entrance to admire. You can also explore the Jume Mosque and Shah Abbasi Caravanserai, both important historic institutions for the city folk of Ganja. Also, you can’t miss the Ganja Bottle House, an extremely strange (but unique!) structure built out of various glass bottles. If you’re interested in religious sites or Islam, you can head to Imamzadeh outside of the city to see a pilgrimage site, which consists of a beautiful mausoleum for the Prophet Ali’s descendants. Check out this post for more things to do in Ganja! Budget: If you’re looking for a place to rest your head at a budget price, the Old Ganja Hostel is second to none. With its good location and friendly staff, you can’t find a better place for the money. Mid-Range: For those who prefer more comfort in their stays, the Vego Hotel is a great, affordable hotel in a very central location. One of my favorite experiences in Azberijan was seeing Xinaliq, a tiny mountain village near the border of Russia. As the highest-altitude village in Azerbaijan (and, arguably, all of Europe), a visit to Xinaliq is a glimpse into the ‘real’ Azerbaijan. Here, friendly shepherds, wooly sheep, and friendly villagers come to greet you. The views in Xinaliq are spectacular and, despite the 1 or 2 tours that come through here daily, it truly feels like an untouched destination. To get there, I took a Xinaliq day tour from Baku with Azerbaijan Traveller. 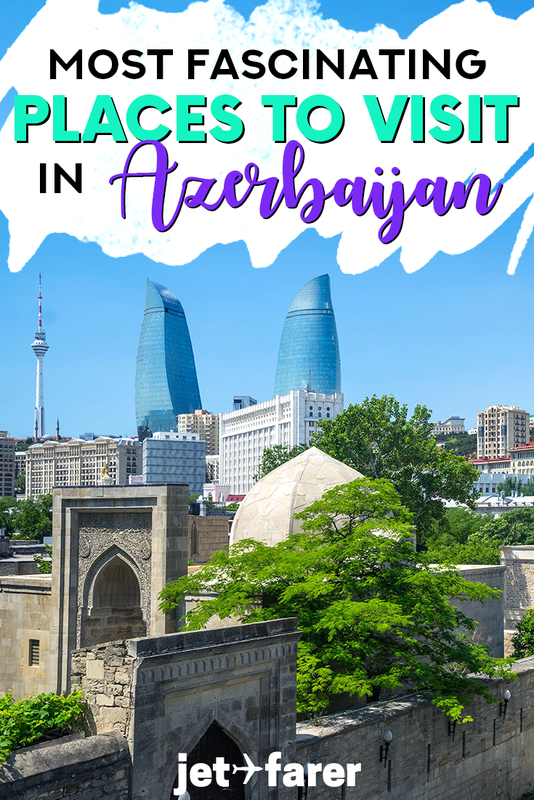 The tour brought us from the paved sidewalks and shiny buildings of Baku to the dirt roads, small village homes, and the provincial area of Xinaliq, and back over the course of about 12 hours. While in Xinaliq, we ate a local lunch in the home of a Xinaliq native, Zaur, who had deep smile lines and loved showing off his postcard collection from around the world. He seemed to be a popular guy! Afterward, we walked around the foggy, rocky streets of the city, played with local children, and admired the views of the eerie, treeless mountains in the distance. If you get the chance to stay here longer than one day, there are countless trails and paths around the mountains, where the only other souls you’ll see will be sheep, cows, and their corresponding caretakers. Many people choose to visit Xinaliq as a day trip from Baku or Quba. However, if you’d like to spend more than one day here, many locals offer homestay options. Should you decide to do this, you’ll be staying in a local home with very basic amenities and probably no indoor plumbing or WiFi. It might sound super strange (and – disclaimer – I didn’t do this myself), but many people organize these homestays via word-of-mouth. Yeah, you can literally just show up in Xinaliq and ask around for available homestays. Before you commit to staying somewhere, be sure to check out the guest room and agree on a price (including meals, as there are no restaurants in Xinaliq). Located at just 2 hours outside of Baku, Quba is an easy day trip from the city. The most popular destination in Quba is the Jewish Quarter. Although Azerbaijan is a predominantly Muslim country, Quba is home to a fairly large population of Jewish people. Many of them don’t live here year round – they simply own homes here and come when they want to get away from the bigger cities. Here, you can walk around the streets full of giant, sometimes colorful houses, or pop into one of the historic synagogues to have a look. I’ll be honest – I didn’t love Quba. After visiting for a short time, I didn’t find there was a ton to do there besides exploring the Jewish Quarter and eating some of the local sweets and pastries. However, I still think it belongs on this list as it is a culturally significant and unique area of Azerbaijan. I’d recommend stopping by if you’re in the area, particularly if you are headed to nearby Xinaliq, as it is on the way. Like I said, I didn’t think there was a ton to do in Quba, so I don’t recommend going there for more than a few hours. However, if you’re hoping to use Quba as a jumping off point for Xinaliq, or if you’re simply more curious about it than I am, you can find a few places to stay in the city here. Located northwest of Baku en route to Sheki (below) is Lahic, a small metalwork artisan town resting high up in the mountains. It’s a bit more developed for tourists than places like Xinaliq, so it’s perfect for a weekend getaway from Baku or a pit stop on the way to another destination. It’s a bit of a trek to get here from the city, but it’s worth it for the local immersion a trip to Lahic provides. While in Lahic, you can wander the town’s cobblestoned streets, stop into local metal design shops, and even stumble upon livestock that runs amok in the streets. You can also experience the provincial Azerbaijani life by staying in a homestay and sampling some unique local dishes. Like Xinaliq, there are a number of local homestays and guest houses available in town. You can either arrive in Lahic and ask around for a place, or book one of the handful of Lahic guest houses on Booking.com. Sheki is a small town near the border of Georgia that served as a prime trading post on the Silk Road. Here, the local townspeople manufactured their own silk products (aptly-named “Sheki silk”) and ran large caravanserays to trade goods from around the world. Today, Sheki still stands as a quaint area where visitors can explore historic buildings and trading posts, purchase local artisan handicrafts, and enjoy the laid-back pace of life in the more provincial part of Azerbaijan. While in Sheki, one of the most significant sights in the area is the Palace of the Sheki Khans, a UNESCO World Heritage site. Built in 1797, the palace is full of intricate tile work, beautiful interior murals and art, and a small garden. On the grounds surrounding the palace, there are a few areas to shop or drink tea. Just outside of the palace area lies Sheki’s historic district, complete with an old Caravanseray converted into a hotel, lots of antique shops, and some beautiful historic homes to admire. Perhaps the nicest thing about Sheki is that it’s surrounded by hills and forests, making it a nice getaway from the busier cities. Budget: If you’re looking for a comfortable hostel in Sheki, the Inci Design Hotel & Hostel is a fabulous option. The rooms are beautifully designed and colorful, and it’s a clean and cozy place to rest your head. Local Guesthouse: If you want to experience local life by staying in a homestay, Sheki is a great place to do it. Booking.com has a few of these to choose from. I stayed in Sah Ismayil Guest House and was very comfortable, save for the fact that the restroom was not connected to the rest of the house. But hey, that’s living like a local for you! Higher-End: There aren’t really ‘luxury’ hotels in Sheki, per se, but there are a few higher end hotels you can stay in. The most centrally located of these is the Sheki Palace Hotel, which is just a short walk from both the Old Town and the Palace of the Sheki Khans. Qax is home to one of the oldest civilizations in the world, and has the ruins to show for it. It has changed hands over the years, from Albania to Turkey to Georgia and others. As you can imagine, this area has a lot of fascinating history, and there’s a lot to see here. Within Qax, you can see the Albanian Church ruins and the Georgian church, two strange sights in a predominantly Muslim country. You can also simply amble around the streets, admiring the historic homes and the slow pace of life. Some of the most fascinating places to visit in the Qax area include Ilisu Village (which used to be the epicenter of a sultanate), Qum Village, and the Iceri Bazaar. Because it’s so close to Sheki, many people simply visit Qax as a day trip from Sheki. However, I’ve heard great things about taking more than just one day to explore this culturally rich area. There are a few options for places to stay in Qax available for online booking. Gabala is another ancient city which rests in the rural area of Azerbaijan. It is home to the famed Chakur Gabala ruins, a centuries-old walled city that now stands crumbling. There are also a handful of museums, like the Historical Ethnography Museum of Gabala. And if you get lucky, you might catch a music festival in the city as well. Many Azerbaijani people come to Gabala as a resort destination because it’s located in such a naturally beautiful area. Therefore, tourism here is pretty developed. In addition to Gabala’s historic sites, there are hiking trails, waterfalls, ski resorts, shopping malls, and more. You can take a day trip to Gabala from Baku through TES Tour. However, if you’d like to stay a night or two in Gabala, there are several options, mostly either private hoemstays/guest houses or resort hotels. You can book Gabala hotels online here. Located in the Absheron Peninsula, Yanar Dag is a mound of dirt that would look like an ordinary hill, except there’s a perpetual fire coming out of the ground on one side of it. Yes, you heard me right, the ground here is literally burning. This is caused by the abundance of natural gas in the area, and the fire burned completely unprovoked. There’s a reason why Azerbaijan = the land of fire (literal translation). To visit Yanar Dag, you can base yourself in Baku and take a day trip from there. Have you ever turned on your bathroom faucet only to realize that fire was coming out along with the water? Yeah, me neither. But in Yanar Bulag, there’s a natural spring that flows with water and fire…AT THE SAME TIME. Yeah, it’s possible, and this quirky attraction near the border of Iran is here to prove it. This phenomenon happens because of the methane concentration located deep in the ground, mixed in with the water source. When you turn on the water, it flows out like normal, but the catch is you can light it on fire with a match or a lighter. Crazy, right? Well, people come to Azerbaijan just to collect and use water from the Yanar Bulag spring, which is said to have special healing properties. To visit Yanar Bulag, base yourself in the city of Astara and take a day trip to the spring. Third on the list of weird natural attractions in Azerbaijan is the bubbling, brown mud volcanoes. A mud volcano is exactly as you might imagine – a cone-shaped mound of dirt with a crater filled with spewing mud. These are caused by pockets of underground gas bubbling to the surface of the Earth and bringing with it some cool, liquid clay. Unlike in other countries (e.g., Iceland) that have this natural phenomenon, the mud volcanoes in Azerbaijan are typically cool to the touch. There are mud volcanoes all over Azerbaijan, but the easiest to access are located a short taxi ride or drive from Baku. Here’s where it gets really weird. In Azerbaijan, they love their oil so much they’ll literally bathe in it. And as a tourist, you can too. In an area called Naftalan, near Gabala in the west, there are many resorts and spas dedicated to the service of crude oil baths. Yeah, that’s a real thing. This type of crude oil, called “green oil,” is believed by many people to have health benefits for those who bathe in it. One of the most beautiful and least-explored areas of Azerbaijan, the Nakhchivan Autonomous Republic is an incredibly tranquil and picturesque place to visit, especially for photographers and landscape lovers. Flights to the region from Baku are pretty inexpensive, and visitors could spend days gallivanting through its empty roads and beautiful mountain areas. Wildlife lovers, rejoice! Azerbaijan has some incredible areas for bird watching, wildlife viewing, and hiking. 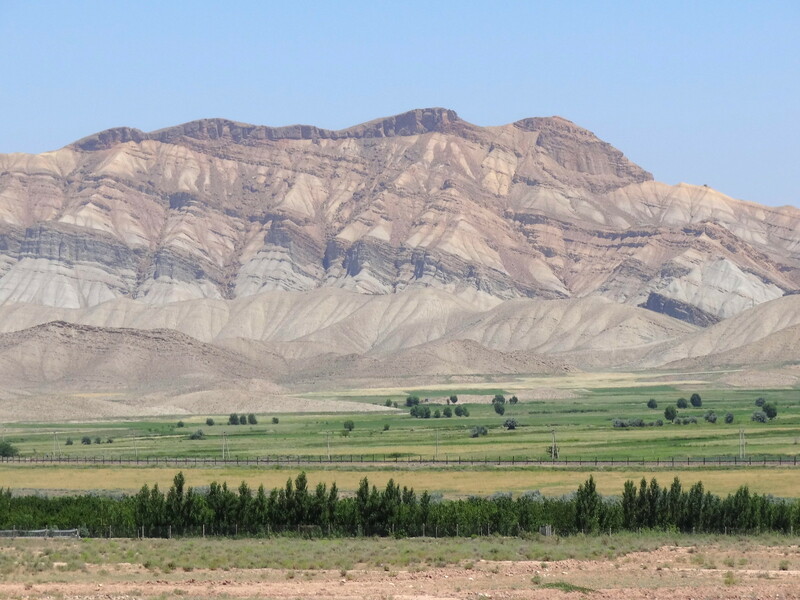 Two of the best places to do these things are Shirvan and Agh-Gol National Parks. As protected wildlife reserves, these parks boast amazing flora and fauna for the National Geographic-type traveler in you. Located near Ganja, Lake Goygol is arguably one of the most beautiful places to visit in Azerbaijan. It’s a beautiful lake region located in a natural park area and surrounded by mountains and forests. For outdoor lovers, this is a fantastic getaway from Ganja, as it’s incredibly serene and full of outdoor activities like hiking. From afar, Gobustan National Park looks like a heap of boulders and large rocks piled onto the side of a mountain. However, the special thing about this park is not the rocks themselves, but the ancient petroglyph carvings on them that give us a hint of what life was like in the earliest Azeri civilizations. For the history and archaeology lovers out there, Gobustan National Park is a must-see. Many of the petrogylphs in the park date back thousands of years, and are still easy to spot on the rocks today. There are several pathways around the park that lead to some of the most distinct carvings. You can explore Gobustan as a day trip from Baku. Last but not least, one of the most special places to visit in Azerbaijan is its coastline bordering the Caspian Sea. But it’s not really a sea. The Caspian Sea is technically the largest lake in the world, and is composed of saltwater like an *actual* sea. While much of the sea is being used for oil drilling, there are a few resort areas in Azerbaijan where you can explore the water and relax by the shore. Want to book your stay? Booking.com and Hotels Combined are both great places to start. I recommend checking both and comparing prices. Trying to find a flight to Azerbaijan? Compare flights on CheapoAir and Expedia to snag the best deals. Need travel insurance? We love World Nomads – and they’ve got your back in Azerbaijan. Want to learn more about Azerbaijan before you go? Here are some great books that can help. Have more questions? Find us in our Jetfarer Facebook group to ask questions and get real-time feedback from travel experts! ‘I didn’t love Quba’ – I had to laugh when I read that! I had the absolute worst travel day of my life when I went to Quba. It was raining, grey and miserable, none of the ATMs in town were working, the owner of our guesthouse ran off with our passports, and we couldn’t find anything decent to eat except kebabs. I was so depressed! But then… We visited an amazing carpet weaving workshop, which was one of the highlights of our whole trip! Funny how travel can be like that. Sheki was my absolute favourite, and I’d go back to Baku in a heartbeat!